LD Collins - the home of Cyclogest. This site is intended for healthcare professionals. Information for patients is available via a link on the Patient Information Leaflet page. Patients with detailed queries about this product should speak to their doctor. 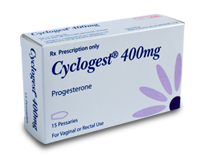 Cyclogest is a product indicated for use in ART (Assisted Reproductive Technology), premenstrual syndrome and postnatal depression. Cyclogest is available in over 30 different markets around the world and marketed by several partners on a territory by territory basis. This site offers an introduction to the company and its history, as well as information on Cyclogest and its areas of application. A patient information leaflet is available in the “Cyclogest” section. If you have any questions regarding L.D. Collins and Co. or Cyclogest that are not answered anywhere, please refer to the Contact page. Cyclogest is a product indicated for Pre-menstrual Syndrome & Post-natal Depression.